We always have a little competition when we go out to eat. Whoever orders the best dish in each course, wins. The prize is obvious, though we do end up sharing most dishes. Of course, there are bragging rights. Don't underestimate the importance of those. V will readily admit, I usually win. I have a good eye for reading between the lines of menu descriptions, and a good sense for what a restaurant's strengths might be. The other night, we took our moveable contest to Červená Tabulka. After some debate with Czech speakers, I'll go with translating that as the Red Slate (if you have a better suggestion, feel free to let me know). I'd heard a few recommendations for the restaurant over the years. It's at the end of a street between Náměstí Republky and Florence. 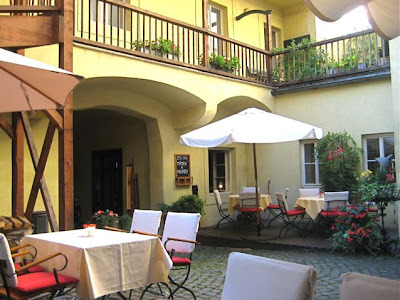 The restaurant has a cozy courtyard for outdoor dining. It was a warm summer evening, so we decided to eat out there. Only a couple of other tables were occupied. The restaurant's interior didn't grab me so much. 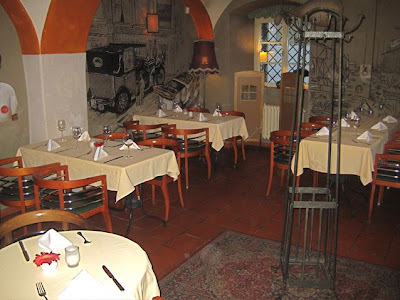 The chrome-backed chairs and the murals on the walls were not so appealing. The design felt somewhat confused. 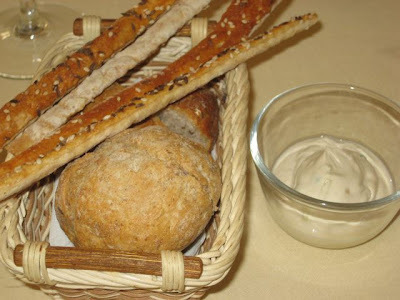 We received a bread basket and butter mixed with leeks (they could have been chives). The bread was a bit hard, but the bread sticks were nice. 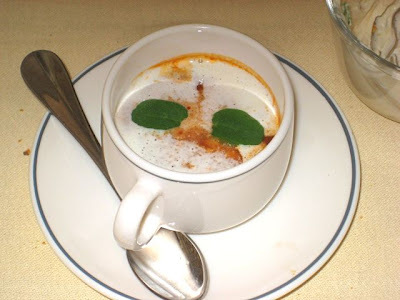 The waiter brought out an amuse bouche -- a very small cup of lobster bisque. It was excellent. Very creamy, it was the most lobster-like version I can remember. For the first course, I had the scallops marinated in red beet juice with a light field salad and orange-dill sauce (190 CZK). The very thinly-sliced, raw scallops with the red accents certainly were pretty on the plate. 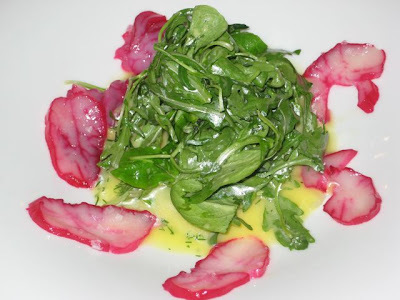 The salad had rucola and mache. The dressing, pooled at the bottom of the bowl, was sweet and tart and the dill was assertive. I do wish the scallops made more of statement besides good looks. The texture and freshness were fine, yet they didn't add much flavor. Scallops are not cheap, but I judged it a rather expensive and insubstantial salad. V ordered the "sea fruit" selection (220 CZK). It consisted of grilled octopus, a scallop, squid with fish sauce, and vegetables. The scallop was mentioned in the Czech menu, but not in the English version. The octopus and squid were very tender on the inside and just lightly chewy on the outside. They were very different from the tough, but tasty grilled ones we had recently in Greece. The scallop was fine. There were carrots and celery root that had absorbed some wonderful flavors. The sauce was amazing. Thick and creamy. I asked the waiter what was in it, but unfortunately, his description was more comical than useful. Something about seafood being cooked in the pan and saving the juices. That's about all I could understand. But, no question, V won Round 1. 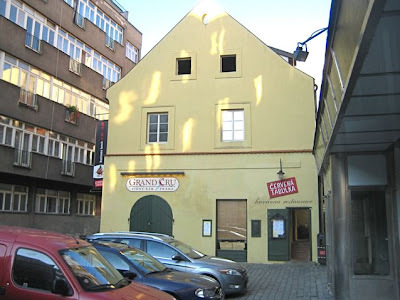 For drinks, I had a couple of Budvars (40 CZK each). V had four glasses of Sauvignon (55 CZK). There aren't many wines by the glass and the wine list is on the expensive side. She had only planned on three glasses, but the waiter brought a fourth by mistake. He was going to take it back, but told him not to worry about it. We also had three bottles of Mattoni sparkling water (35 CZK each). There was a second amuse bouche between the courses. 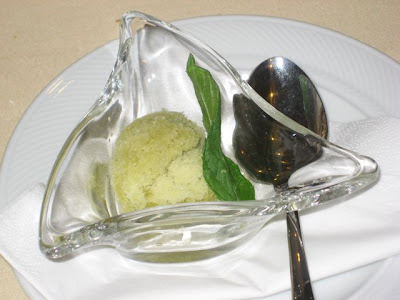 It was a sorbet made with mint, lemon, possibly lime, and mint. Very refreshing. A nice palate cleanser. For a main course, I decided on the confit of beef sirloin with potato purée and baby carrot (420 CZK). The beef had been cooked long and slow, like a ragout. It was reminiscent of a hearty stew. 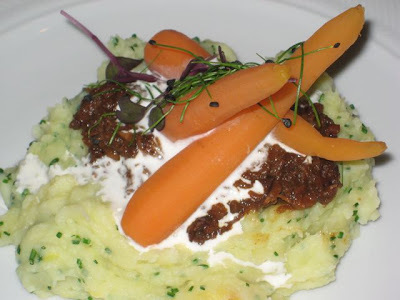 The potatoes were just right, and the carrots had a nice little crunch. It was OK. I'm sure a fair amount of effort went into making it. 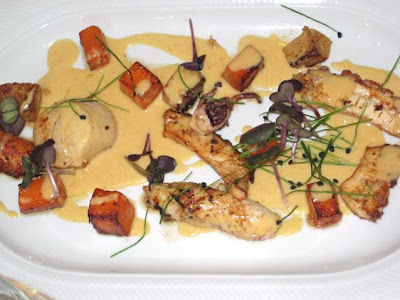 But the very filling dish did taste like rather ordinary comfort food, and I didn't feel it was worth the big price. V went for the lamb saddle with smoked Grenaille potatoes, tomatoes, and capers with mustard sauce (420 CZK). It was terrific and a very generous serving, with six bones. 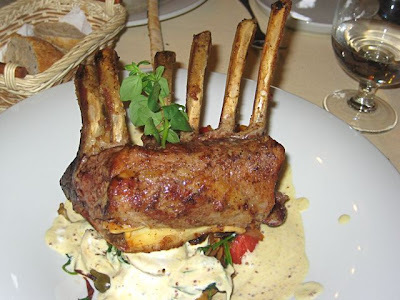 At many top end restaurants these days, you'd get less lamb for the money. The meat was well-seasoned, very tender, and delicious. The cream-based mustard sauce worked well. The small tomatoes were cooked to softness. The potatoes had an intense, smoky flavor. They tasted quite similar to some hickory-smoked barbecue sauce I brought over from the USA (I'm not sure how they achieved that flavor). The total bill was a fairly steep 1655 CZK. I'd go back for some of the dishes. Just not mine. Which probably tells you how I did in Round 2. Brewsta, That's where I had my going away party ... you didn't come to that? 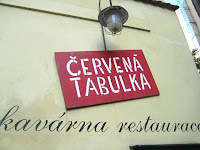 My wife and I used to go to Cervena Tabulka quite a lot, but it was always hit or miss. Sometimes we would think we had struck gold - and vow to go every week - and other times we might as well have been in an ordinary pub. I also agree about sitting outside being the best option. 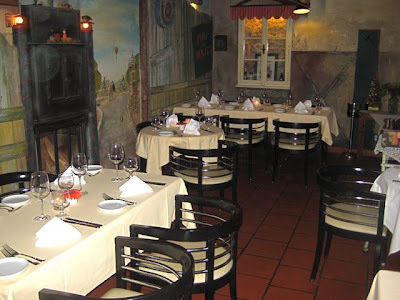 The inside is pretty dark, and also very small - so it gets rather smokey if anybody nearby lights a cigarette. You are right about the lamb, though. It might even be worth phoning ahead to ask if they have it on the menu that night. If they do, make a booking. If not, it might not be worth your trouble. Mark, I did remember the party and even mentioned it to V. That was the night that Big B did a spread eagle on the front of a taxi. But I only drank, as far as I can remember. Yes he did ... As I recall you guys showed up late and only drank. 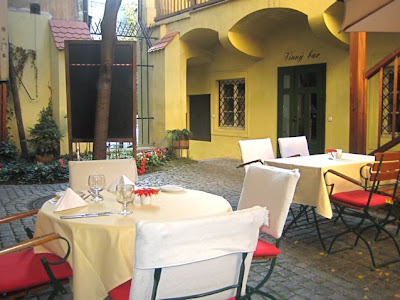 I used to go to Cervena Tabulka all the time around 2004-2005 and it was probably my favorite restaurant in Prague for a while (hence the party venue choice), but I stopped going a couple of years ago .. Good to know it's still open and going strong!